A segment of Mexican fans had a hard time accepting that Mexico's World Cup team included Argentine-born forward Guillermo Franco and Brazilian-born midfielder Zinha. Nationalistic pride led them to believe that Mexico wasn't one of those countries that needed to import talent to win on the world stage. Given that recent history, it is going to be very, very interesting to see the reaction by fans in Mexico should Sonny Guadarrama one day play for the Mexican National Team. You see, Sonny was born in Texas and has played for the US U-18 and U-20 Youth National Teams. But, his parents are Mexican emigrants and Sonny was raised on Mexican football. 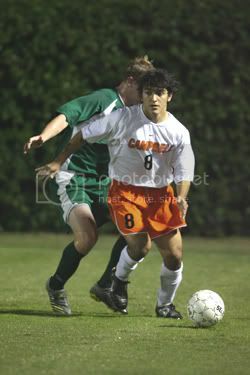 His dream is coming true as the former Campbell Camel signed with Mexican club Santos, in the border state of Coahuila, this past July. Sonny has also made the switch at the Youth National Team level as he has joined the Mexican U-20 National Team and took part in two friendlies versus Ecuador's U20s last week. It appears to be only a matter of time before Mexican fans will start the debate over not only should their be foreign born players on their National Team, but what to do with a player who was born in raised in the land of their arch rivals to the north? I don't care what he wants, Sunil. Just say YES! Soccer America's Ridge Mahoney basically pulls a "I know Pele. And David Beckham is no Pele" when it comes to the rumor du jour of Beckham coming to MLS and what it would mean to the league. In general, I think that Ridge is more realistic with his view than most. But, I think he does go a little to far to the negative side of things when he projects what Beckham might mean for MLS. I do believe that Beckham wouldn't mean a whole lot when it comes to recruiting other world stars to MLS. The only person that will lure players to MLS is Benjamin Franklin. And while I wouldn't expect Beckham to have a huge impact on the MLS gate, I do believe that he will create more buzz for the league, at least in the short term, and that could only be a good thing. But, at the end of the day, the key will be creating a climate where it is economically viable for every team to have "their own Beckham". So when Columbus visits Toronto, Toronto FC can market a match up of Buffon versus Robinho as opposed to only having a world star come to town the once or twice a year that Beckham and the LA Galaxy make the trek north of the border. Kenny Cooper returned to the US after his run with Manchester United ended with only reserve league matches on the forward's resume, along with loans to English club Oldham Athletic and Academica Coimbra in Portugal. Well, now Cooper can add 2006 FC Dallas MVP to the list of accolades he's received in his soccer career. Cooper finished the regular season second on the team in goals to Carlos Ruiz with 11. But, Cooper was tied for the league lead in game winning goals with 6. It will be interesting to see if this breakout performance by the 6'3" forward will get Cooper into the US National Team mix. With Brian McBride retiring from international competition, Cooper would appear to be a guy with a shot to try and fill that target forward role for the US.